Home | New snow blowers for John Deere lawn tractors. Available in time for this year’s winter season, John Deere is introducing two new snow blower attachments for its X300 and X500 Select Series lawn tractors. Durable and easy to install, these 112 and 119cm (44 and 47in) snow blowers increase the versatility of Select Series lawn tractors for year-round use. Homeowners and small business owners alike will find them simple to use and highly efficient at both processing and handling snow. The heavy-duty, two-stage design allows these snow blowers to perform consistently in various operating conditions. Protected by a heavy-duty steel housing, a low-speed auger gathers the snow. A high-speed rotor then discharges it at a constant velocity, even in light snow conditions, through a rotatable chute. Constructed from high molecular weight plastic, the rotor is sturdy and resistant to rust. Installation and removal are made simple with a quick-hitch mounting system. The snow blower attaches to the front of the tractor and locks onto the hitch. Designed and built by John Deere, these snow blowers are making their European debut after many years of proven performance in the USA. 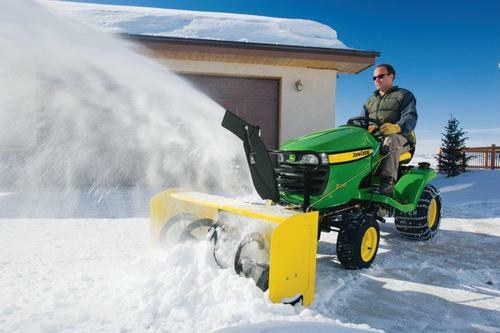 The new snow blowers will be available at John Deere dealers in October 2013.